Yesterday morning, Edith and I awoke to find the sky clear and the hillside luminous white. But “luminous” doesn’t even begin to describe the combined intensity and subtlety of what we saw. The woods beyond our meadow weren’t so much illuminated by light as made of light. I ventured outside to find out why. The reason: all the trees were covered with tiny accretions of ice. Not snowflakes, not frost, not sheaths . 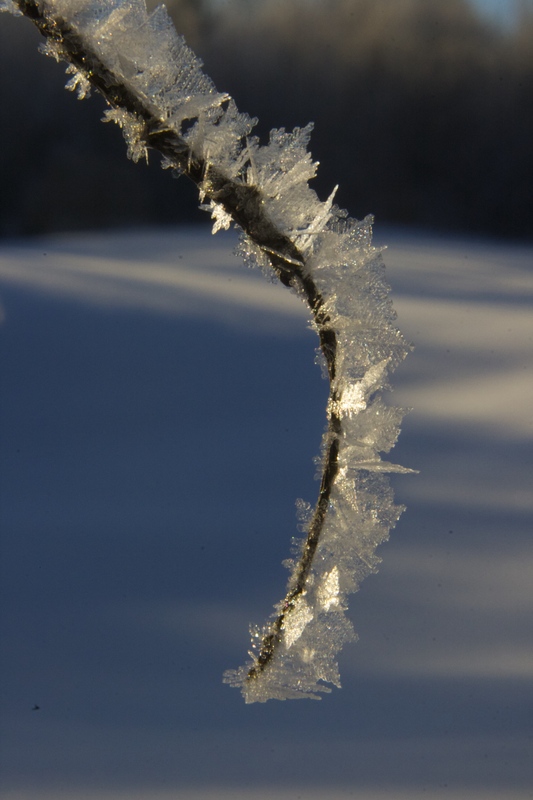 . . but, instead, countless delicate structures that had formed on everything overnight. Multiply 2,000-5,000 twigs per tree times half a million trees visible from Hyland Hill and you have a radiant hillside at dawn. This entry was posted in Land and Wildlife by Ed @ Montemayor. Bookmark the permalink.